This is quite revealing for me. While last year I spend considerable chunk of money (spent online) buying books, this year books formed a very small piece. 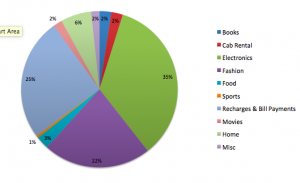 35% of money I spent shopping online last year, was spent on buying Electronics (mostly mobiles) & related Accessories. 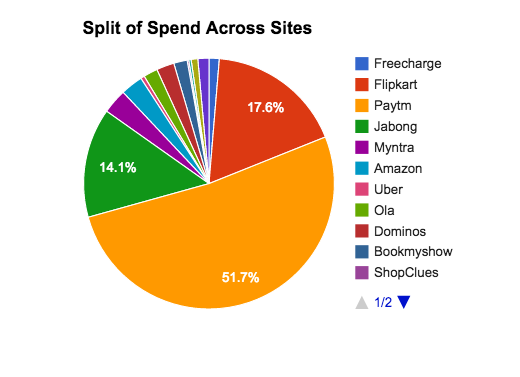 25% was spent on recharges/bill payments and a significant change towards Fashion with 22% of my spend went there. 5) I’ve jumped the ship completely when it comes to paying by card. Almost, all my purchases (90% +) are pre-paid now. 8) Newly caught trend of using wallets to pay on various sites to get discounts and cashbacks is a good incentive to use them. I’ve used Paytm, mobikwik and Payumoney, depending on the offers they are running. 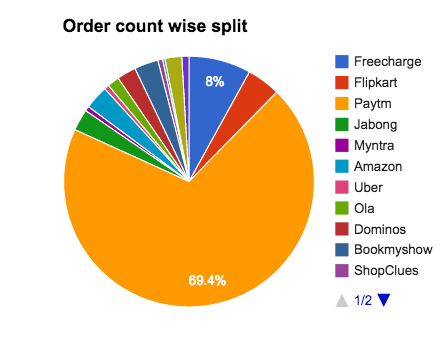 10) Product wise – Wishlist and Rating/Reviews are by far the most useful features. Also, I love the feature to sort/filter using discount/offers (or the lack of them). This entry was posted in business, customer service, e-commerce, health & wellness, marketing and tagged e-commerce, flipkart, india, jabong, mind, mobile, myntra, paytm, sale, shopping, wallet on January 3, 2015 by mayank.